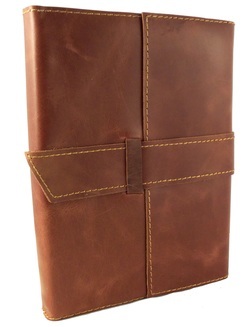 Specializing in handmade rustic leather journals, notebooks, leather photo albums, and more. 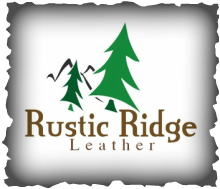 Rustic Ridge Leather journals are made with high quality genuine leather and filled with quality acid free paper. Our leather journals and notebooks will give you an element of style that you will not find in modern types of journals and notebooks. Refillable Leather Travel Journal with Handmade Paper - 6" x 8"
This Refillable Leather Travel Journal is the perfect way to record your adventures, thoughts, poetry, sketches, and more. The leather cover is made from high quality leather that not only looks great, but will last for years to come. The travel journal includes 200 cream colored pages (100 sheets). The acid-free, cotton paper the perfect surface for writing or sketching with a pencil, ball point pen, or your favorite fountain pen. Perfect size to carry with you on trips, vacations, or for daily journaling.